Did you ever dream that 7 deadlift muscles worked can change your life? The deadlift is only one exercise you might think, how good can it be? The truth is that the deadlift is more than a prescription for looking and feeling powerful. You can not only change your body, but even your life with the conventional barbell deadlift. First of all, the simple deadlift, if done with proper form, can dramatically change your body. And not only if you use heavy weights. Even dead lifting lighter weights can have a profound impact on your health and fitness. 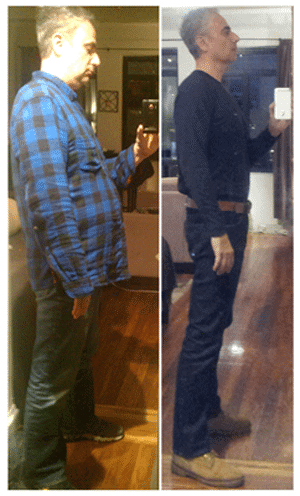 You can transform from a couch potato to lean and strong. The reason that deadlifts are so powerful, is because the deadlift works most of the muscles of your entire body. From your head to your feet. In other words, your entire upper body and lower body. Very few weight training exercises can match the muscles involved in all deadlift variations. Whether you do conventional deadlifts, sumo deadlifts, stiff leg and Romanian deadlifts. Therefore, even a progressive beginner deadlift workout program will change your body. And changing your body is the first step to change your life. In short, deadlifts build muscle, fight obesity, build confidence and boost your mood. You would become fabulously wealthy if you could package the benefits of deadlifts in a pill. But, you do not need pills, you just need to deadlift. However, if you need to lose weight, follow these 5 simple steps to lose 20 pounds in 3 months. Deadlifts are better than any antidepressant out there, I know, I used many. Deadlifting can help you fight obesity faster than you could ever imagine. The deadlift can help you rebuild your life if you are trying to recover from loss, divorce, breakups or estrangements. No matter what your age, you will benefit from deadlifts, even if you are over 80. The deadlift is a primal and basic lifting exercise that builds muscle, strength and confidence. A stronger you will be a greater asset to yourself and everyone you care about. This article will focus on the most important deadlift muscles activated. 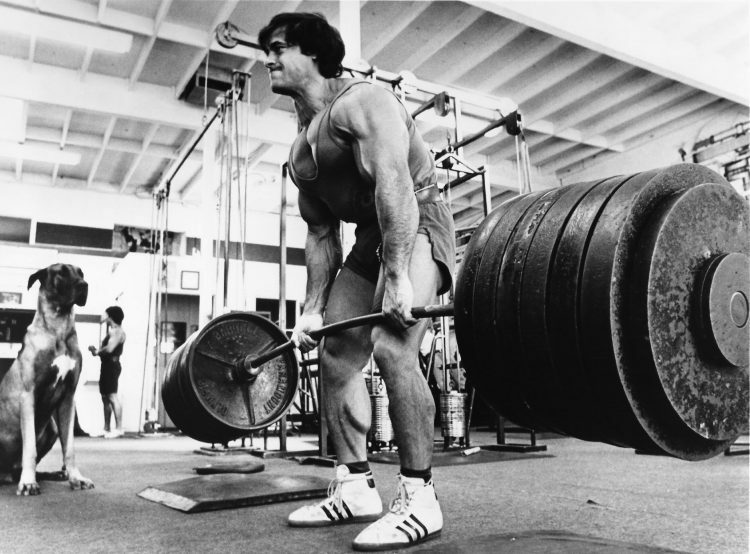 This article explains why the deadlift is a great tool for mental and physical fitness. To be clear, the deadlift is not a squat. Squats will work your legs, specifically your front quadriceps. The deadlift is primarily a push floor, drive hips, pulling move, which targets your back muscles. In fact, all of your back muscles. As a result, you build a stronger back and can prevent back pain. Back pain is the most common type of chronic pain in adults in the United States. ((https://www.verywellhealth.com/conditions-most-often-associated-with-chronic-pain-2564563)) Therefore, use the deadlift to strengthen your back, not to injure your back. So, you must deadlift with the best form possible. Keep your back straight and neutral when you deadlift. Never deadlift with a rounded back. 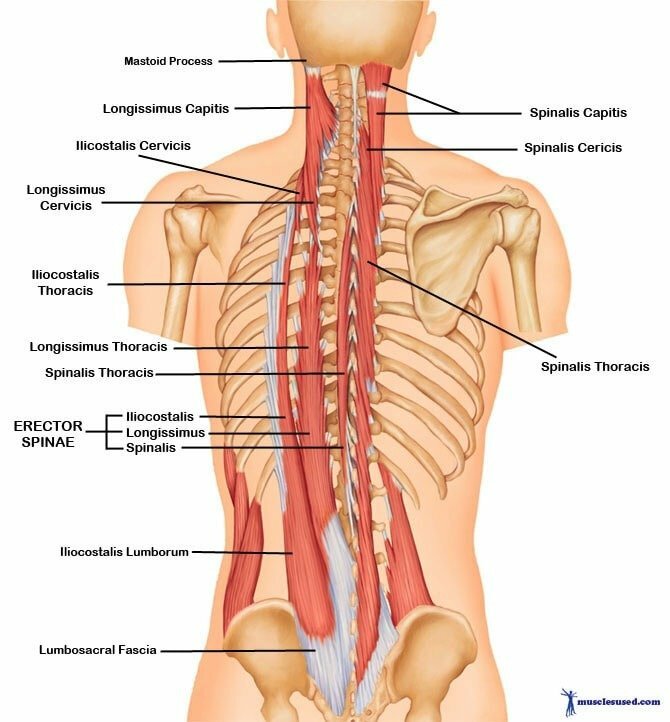 The Erector Spinae muscle actually consists of three columns of muscles, the Iliocostalis, Longissimus, and Spinalis, each running parallel on either outer side of the Vertebra and extending from the lower back of the skull all the way down to the Pelvis. One of the main muscles engaged in the deadlift are the erector spinae muscles. These are powerful muscles, which help you to bend forward as well as return to a standing position. The spinal erectors run down your back, from the base of your skull to the lower vertebrae. When you deadlift, you are working your entire posterior chain, from your hips and knees up to your head. Warning: You must maintain a neutral back, a flat back, all throughout the deadlift. From when you lower your hips to grip the barbell through your deadlift and return to the floor. Besides the erector spinae muscles, the deadlift also works your latissimus dorsi muscles. Having strong lats helps to give you the coveted V shape in your back. The deadlifts muscles trained in the arm region include many of the muscles in your arms. For example your , flexor digitorum profundus (forearms), and finger flexors (grip). The pronated or overhand grip where both palms are facing you. The alternating grip where one hand is overhand and the other is underhand. As your deadlift weight increases, you will likely begin to use the alternating grip. This is necessary to prevent unwanted rotation of the barbell. However, you need to be careful to not injure your biceps when using the underhand grip. The best way to prevent injury to your biceps is to keep your elbows locked and arms straight. Never, ever try to pull the bar up using your arms alone. 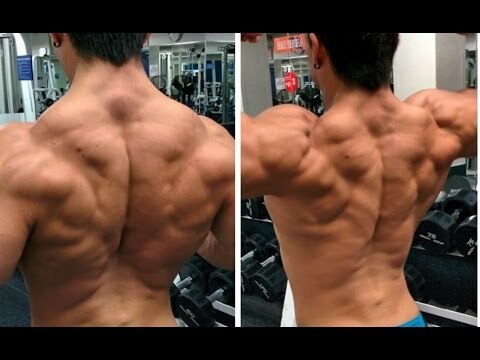 final pull by your entire back muscle groups. The deadlift also targets the medial deltoid of your shoulders. You develop stronger shoulders as you continue to deadlift. You pull your shoulders back and work your trapezius muscles in the completion phase of the deadlift. World record dead lifters usually have tremendous trapezius and shoulder development. The deadlift activates almost every muscle in your body including the abdominal muscles as well. Therefore, you stabilize your spine in the deadlift with your abdominal muscles. The largest muscle in your body is the gluteus maximus. The biggest of the three gluteal muscles, also known as the buttocks. The deadlift is an excellent exercise to train your hamstrings and glutes. Consequently, keep deadlifting and you will look a lot better in pants. The muscle groups targeted in the legs include your quadriceps on the front of your thigh. As well as your hamstrings on the back. While the hamstrings only act as stabilizers during the deadlift; the quadriceps are the main muscles the deadlift works in the legs. In summary, the deadlift works all the major muscle groups of your body. You cannot compare the number of deadlift target muscles to most other weight training exercises. Take the ever popular biceps curl for example. Think of the size of your bicep. Now, think of the size of your back. Even though you cannot see your back, you know your back muscles alone are much larger than your biceps. If the deadlift only worked your back muscles, the deadlift would still be superior to curls. But, the deadlift works many more muscles than just your back. This is why you should not waste your time only doing curls, squeezing a handgrip or even the bench press. Yes, the deadlift will even work the muscles of your hand, and strengthen your grip. In conclusion, deadlifts are one of the most powerful exercises you can do to dramatically change your body. What Muscles Do Deadlifts Work ? The deceptively simple conventional deadlift will work the largest muscle groups of your body. Bottom line, these 7 deadlift muscles worked include most of the muscles of your body! So, the short answer to the question what muscles do deadlifts target is “all of them”! If you only have time for one exercise, do the deadlift. Deadlifts will add a layer of metabolically active muscle that burns fat everywhere. You will change your body. And you will change your life. As far as deadlift gear goes, deadlifting requires a small area and a minimum amount of equipment. All you need is an olympic barbell and bumper plates and/or weights. These are available in most gyms that have free weights. On the other hand, you can ditch the gym and set up a small area of your basement or garage with minimal weightlifting gear. Great CrossFit and deadlift shoes. They keep you low to the ground, provide foot stability, and prevent knee sprains. Before Nike, I wore a typical rubber gym shoe and sprained my knee doing squats. Don't let that happen to you. Since I started wearing Nike Metcon 4 Cross Training Shoes my knees have felt great. Wear the best shoes for squats and deadlifts. Prevent shin scraping and keep your knees and lower legs warmed up. I suffered many shin scrapes and bruises until I started wearing proper shin protection for deadlifting. This is why I highly recommend Moxy deadlift socks. For stronger shin protection beyond deadlifts. RockGuards are designed to protect your shins during rope climbs, cleans, snatches, and box jumps as well. For a more detailed review, see the 5 Best Deadlift Shin Guards on the Market Today. Strong support for squats and deadlifts, which both require bracing your core. A powerlifting belt helps you learn how to brace, besides protecting your back. Single prong is easier to get on and off. This belt is an IPF legal power lifting belt. This means you can use this belt in any powerlifting competition sanctioned by the International Powerlifting Federation. I would not leave home without a single prong belt on a squat or deadlift workout day. Get started with the right warm up and deadlift workout. Following a plan leads to success. The Bible of basic barbell training. Learn how to squat, deadlift, squat and bench press, the basic powerlifting lifts. Above all, deadlifts helped me improve my mental and physical health and fitness after the age of 55. They can do the same for you, no matter what your age.